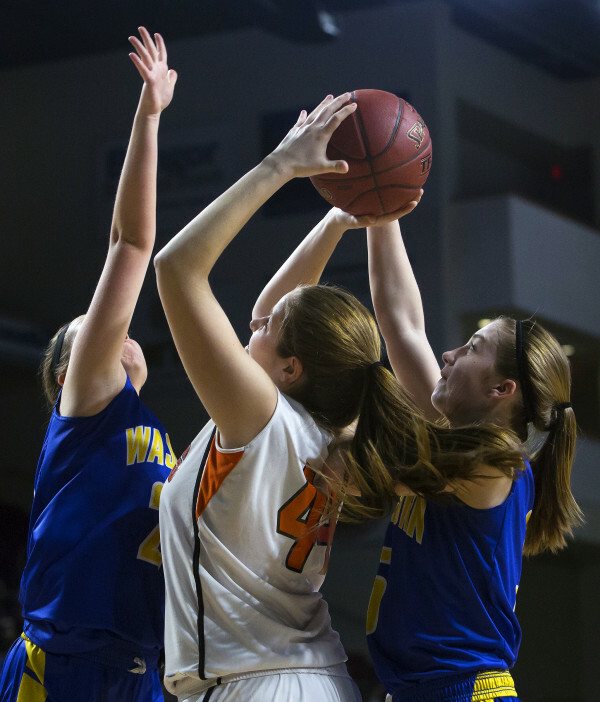 Shead's Madison Greenlaw (right) battles for a rebound against Washburn's Maggie Castonguay during their Class D girls basketball semifinal game at the Cross Insurance Center in Bangor Thursday. Shead's Cassidy Wilder (center) is fouled trying for two by Washburn's Mariah Davis (left) while teammate Washburn's Maggie Castonguay gives defense during their Class D girls basketball semifinal game at the Cross Insurance Center in Bangor Thursday. 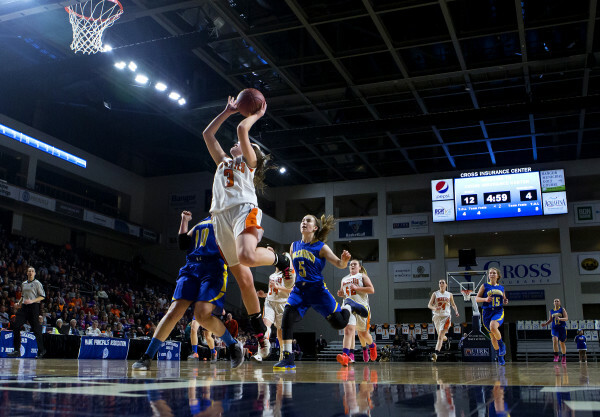 Shead's Holly Preston (center) drives up for two past Washburn's Kassandra Farley (left) and Washburn's Maggie Castonguay during their Class D girls basketball semifinal game at the Cross Insurance Center in Bangor Thursday. 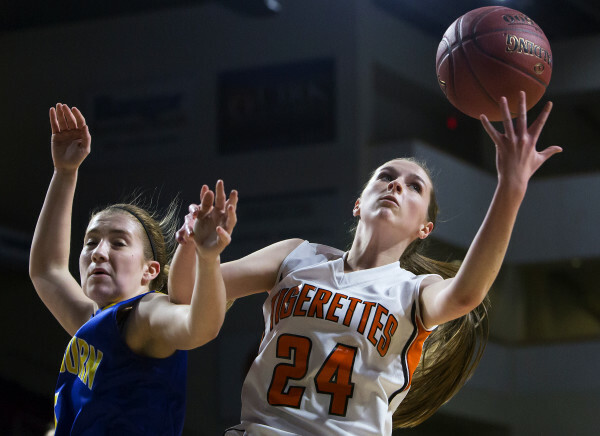 BANGOR, Maine — It wasn’t pretty at times on the offensive end for the Shead girls basketball team Thursday night, but the Eastport-based Tigerettes put on a defensive clinic in returning to the Class D North regional championship game. Coach Dean Preston’s club pressured, harassed and overwhelmed sixth-ranked Washburn all over the Cross Insurance Center floor as the second-ranked Tigerettes posted an impressive 51-29 victory over the sixth-ranked Beavers. The reigning regional champions (18-2) will look to repeat on Saturday morning at 9:05 against top-ranked Southern Aroostook of Dyer Brook (19-1), which knocked off No. 4 Easton 48-42 in the later semifinal. Washburn wraps up its season 11-9. After finishing the opening quarter on a 9-2 run, the Tigerettes went to work over the second eight minutes, holding Washburn scoreless while Holly Preston scored seven of her game-high 24 points over that span to help Shead take a 20-4 halftime lead. It was a perfect night for Preston, the coach’s daughter, shooting the ball as she connected on all 10 of her field-goal attempts, using a very quick first-step and excellent vision toward the basket in attacking the rim. Her pass-first mentality helps in that aspect. “I always try to find the open teammates and that helps me create shots,” Preston said. The Beavers had all sorts of trouble penetrating to the basket against the aggressive Shead defenders, and had to settle for outside shots most of the way. Whenever the Beavers could get toward the hoop, the Tigerettes were right there to contest the shots. Shead held Washburn to just 12 field goals during the contest while Madison Greenlaw (10 points, nine rebounds) and Cassidy Wilder (nine points, 11 boards) bogged the Beavers down in the post. Shead’s experience on the Cross Center floor showed throughout the night, as even when Washburn fell behind by double-digits early in the second quarter, the Beavers didn’t show much of a sense of urgency to attack the basket thanks to the Tigerettes’ height advantage. Dean Preston felt his team was a little careless with the ball at times, making hurried passes but that’s something he feels his squad can clean up before Saturday. “We didn’t have great ball security,” he said. Maggie Castonguay’s 10 points paced Washburn.